There is no doubt that the Spanish nation continues to produce world class sportspeople and teams throughout all the major sports. Spanish tennis players are no exception where there is no shortage of instantly recognisable names. The depth of talent in Spanish tennis is enormous. In the current epoch there is no shortage of instantly recognisable names and Spanish tennis players are involved across the globe in all major tournaments. They outnumber all other nations in the ATP top 50 rankings, where there are currently 9 Spanish players, with 3 players in the top 10: Nadal 2; Ferrer 5; and Almagro 10. Many people have suggested all sorts of special reasons for this comprehensive level of success, but it is probably just a combination of all these factors over a number of years which have produced the result. Their young players' early game is nurtured on clay which allows the defensive game to be consolidated and honed to a deep level. They are encouraged to participate in tournaments at a young age also, and receive top level support and guidance from their tennis federation. Excellent facilities and all year round good climate obviously promote a good environment to develop skill levels. As they get older, they are also introduced to a variety of playing surfaces which fosters skills in offence, but built on the early foundation of impeccable defensive games. The high level of peer competition which results from these favourable conditions generates further improvements in all round tennis ability, which produces Spanish tennis players who dominate the world! Rafa Nadal was born in 1986 in Majorca and is currently World No. 2 and Olympic gold medallist in singles. He has been coached by his uncle Toni Nadal since he was small and has developed into one of the greatest players of all time. His six Grand Slam final wins come on top of a stellar junior career during which he won everything going. At only 23 years of age he has won over $25 million in prize money making him the 4th highest earner of all time. Rafa Nadal nació en 1986 en Mallorca y es la actualidad Mundial Numero 2 y medallista de oro olímpico en individuales. El ha sido entrenado por su tío Toni Nadal desde que era pequeño y se ha convertido en uno de los mejores jugadores de todos los tiempos. Sus seis victorias Grand Slam están por encima de una carrera junior estelar durante el que ganó todo lo que pasa. En sólo 23 años de edad que ha ganado más de $ 25 millones en dinero del premio convirtiéndose en el cuarto mayor fuente de ingresos de todos los tiempos. Robredo was born in 1982 in Girona and started playing at 5 years encouraged by his parents who were both good tennis players themselves. In fact his father, Ángel, coached him until he was 14 when he went to the Spanish Tennis Federation Centre for High Performance at Sant Cugat del Valles. He rose up the rankings after good progress in several tournaments, moving into the top thirty by 2001. 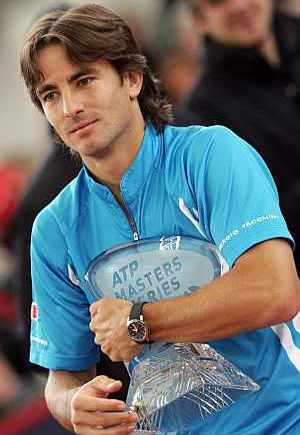 In 2002 he helped to win the Hopman Cup for Spain and in 2004 he won his second ATP title. When he won the Hamburg ATP Masters in 2006 he moved into number 7 ranking in the world, eventually reaching 5 by end of year. His long wavy hair has earned him the nickname of Disco Tommy, and he has cultivated quite a high profile media persona, after appearing in several magazines. His career earnings are about $10 million and he currently lives in Barcelona. Robredo nació en 1982 en Girona y comenzó a jugar a los 5 años alentados por sus padres que eran ambos tenistas buenas ellos mismos. De hecho su padre, Ángel, le entrenó hasta que él tenía 14 años cuando pasó al español tenis Federación Centro de alto rendimiento de Sant Cugat del Valles. Él levantó las clasificaciones después de un buen progreso en varios torneos, moviéndose en la parte superior treinta en 2001. En 2002 ayudó a ganar la Copa Hopman para España y en 2004 ganó su segundo título de la ATP. Cuando ganó el Masters ATP de Hamburgo en 2006 se trasladó en ranking número 7 del mundo, llegar a 5 por fin de año. Su pelo largo ondulado le ha valido el apodo de Disco Tommy, y él ha cultivado una persona medios de alto perfil, después de aparecer en varias revistas. Las ganancias de sus carrera son unos $10 millones y actualmente vive en Barcelona. 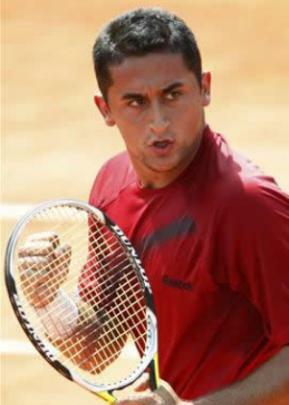 Nico Almagro was born in 1985 in Murcia and started playing tennis at 8 becoming a professional at age 18. His preferred surface is clay and certainly most of his ATP finals appearances have been on this surface. His serve is a potent weapon and gains many free points with his quick action. In recent times he has reached advanced stages of the Australian Opens in 2010 and 2011, Miami in 2010, Brasil Open, Copa Telmex, and Open de Nice Cote d`Azur. Current ATP ranking is 15 and career earnings almost $5 million. He just lost to Mikhail Youzhny in the last 16 of Wimbledon 4-6 6-3 7-6 6-3 on 25 June 2011. Currently he still lives in Murcia. Nico Almagro nació en 1985 en Murcia y comenzó a jugar tenis en 8 convirtiéndose en profesional a los 18 años. Su superficie preferida es arcilla y sin duda ha sido la mayoría de sus apariciones de finales de la ATP ha sido en esta superficie. Su saque es un arma potente y gana muchos puntos gratis con su rápida acción. En los últimos tiempos ha llegado a etapas avanzadas del Campeonato Abierto de Australia en el 2010 y el 2011, Miami, en 2010, Brasil Open, Copa Telmex y Abierto de Nice Cote d'Azur. Actual ranking de la ATP es 15 y las ganancias de la carrera son casi $5 millones. Él acaba de perder a Mikhail Youzhny en los últimos 16 de Wimbledon 4-6 6-3 7-6 6-3 en 25 Junio 2011. Actualmente vive en la Región de Murcia. Verdasco was born in 1983 and is another player who started at an early age at home and started lessons at four years of age. Through his youth he was coached by some of Spain`s top tennis coaches, and eventually started winning championships. The left-hander turned professional at 18 years and improved his world ranking steadily through the last decade to make it into the top 10 in 2008. 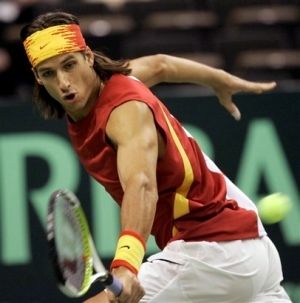 He was part of the Davis Cup team, including David Ferrer, which won in 2008 and 2009. In Grand Slam tournaments his furthest progress was in the 2009 Australian Open, when he lost in the semi-finals to Rafael Nadal in one of the longest matches ever in that competition. His style is to attack from the baseline with a powerful forehand. In 2011 he is ranked No. 22 in the world and lives in Madrid. Verdasco nació en 1983 y es otro jugador que comenzó a una edad temprana en el hogar y inició las lecciones a los cuatro años de edad. A través de su juventud fue entrenado por algunos de los entrenadores de tenis superior de España y finalmente comenzó a ganar campeonatos. El zurdo se convirtió en profesional a los 18 años y ha mejoró su clasificación mundial constantemente a través de la última década está en el top 10 en 2008. Formó parte del equipo de Copa Davis, incluyendo a David Ferrer, que ganó en 2008 y 2009. En torneos del Grand Slam su progreso más lejos fue en el Abierto de Australia 2009, cuando perdió en semifinales a Rafael Nadal en uno de los partidos más largos jamás en ese concurso. Su estilo es atacar desde la línea de fondo con un potente golpe de derecha. En 2011 ocupa el puesto nº 22 en el mundo y vive en Madrid. 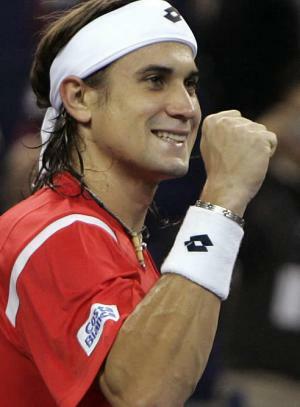 Ferrer was born in 1982 in Xabia and moved to Barcelona when he was 15 to attend the famous Catalan Tennis Federation. He turned pro at 18 and has amassed 13 major titles in his career to date, and is currently No. 6 in the world ATP rankings. A right-hander with two handed backhand, Ferrer is renown for his dogged attitude and speed around the court. He is particularly noted for his ability to return the ball and with Novak Djokovic is probably the best in the world. 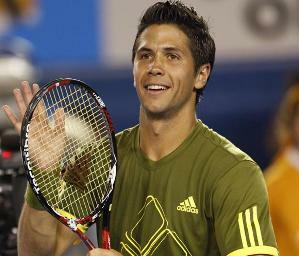 He was part of the Spanish team which won the Davis Cup in 2008 and 2009. Now living in Valencia and still going strong, he will certainly be adding to his career earnings to date of over $10 million. Ferrer nació en 1982 en Xabia y se trasladó a Barcelona cuando tenía 15 para asistir a la famosa Federación Catalana de tenis. Él se convirtió en profesional a los 18 años y ha acumulado 13 grandes títulos en su carrera hasta la fecha y actualmente es número 6 en el ranking de la ATP. Un diestro con dos manos revés, Ferrer es reconocido por su actitud tenaz y velocidad alrededor de la cancha. Se destaca especialmente por su capacidad para devolver la pelota y con Novak Djokovic es probablemente el mejor del mundo. Formó parte del equipo español que ganó la Copa Davis en 2008 y 2009. Ahora vivo en Valencia y sigue pisando fuerte, sin duda añadirá a sus ganancias de la carrera hasta la fecha de más $10 millones. Left-hander López out fought Andy Roddick 7-6 7-6 6-4 to secure a well deserved victory in 2011 at Wimbledon. A close friend of Rafa Nadal, Lopez was born in Toledo in 1981 and turned pro at the early age of 16. Although he has never won any Grand Slams, he has always been a world class player and reached number 20 back in 2005. This was the year he reached the Wimbledon quarter-finals. Tim Henman came up against Lopez in the second round at Wimbledon in an entertaining 5 set match. In 2008 he was beaten by Marat Safin, also in the quarter-finals of Wimbledon, in the year when his earnings almost reached the $1 million mark. His current ranking is 37 and he now lives in Madrid. Zurdo López hacia fuera de combate Andy Roddick 7-6 7-6 6-4 para asegurar un triunfo merecido en 2011 en Wimbledon. Un amigo cercano de Rafa Nadal, López nació en Toledo en 1981 y se convirtió en profesional a la temprana edad de 16. Aunque nunca ha ganado ningún Grand Slam, siempre ha sido un jugador de clase mundial y alcanzó el número 20 en el año 2005. Este fue el año que llegó a los cuartos de final Wimbledon. Tim Henman jugó López en la segunda ronda en Wimbledon en un entretenido partido set 5. En 2008 fue golpeado por Marat Safin, también en los cuartos de final de Wimbledon, cuando sus ganancias casi alcanzaron la marca de $1 millón en el año. Su ranking actual es 37 y ahora vive en Madrid. 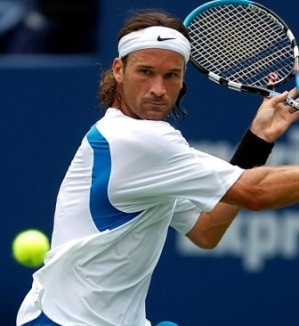 Moya was born in 1976 in Palma de Mallorca and was encouraged to play tennis by his parents from a very early age. He showed such great promise that at the age of 12 was taken under the wing of Jofre Porta and trained by the great retired majorcan player Alberto Tous. During his teens he had no rival in the Balearic Islands and was champion for several years. At 17 he went to train at the High Performance Centre in Barcelona, and was coached by ex Davis Cup star, Juan Bautista Avendaño, and other greats of the Spanish tennis scene. He turned pro in 1995 and quickly imposed his quality on the circuit culminating in 1997 by achieving runner up in the final of the Australian Open. In the following year he won the French Open grand slam at Roland Garros. In 1999 he reached the pinnacle of World No.1 although this was short-lived, as it was soon regained by a certain Mr. Pete Sampras! Since then he has played consistently at the very highest levels, winning many finals and making a major contribution to Spanish Davis Cup teams. He ranks amongst such illustrious players as Federer, Hewitt and Roddick, as having won over 500 matches at ATP level. He currently lives in Switzerland with the Spanish actress Carolina Cerezuela. Moya nació en 1976 en Palma de Mallorca y se animó a jugar al tenis por sus padres desde una edad muy temprana. Mostró una gran promesa de tal manera que a la edad de 12 fue tomada bajo el ala de Jofre Porta y entrenados por el gran ex jugador mallorquín Alberto Tous. Durante su adolescencia no tenía rival en las Islas Baleares y fue campeón durante varios años. A los 17 se fue a entrenar en el Centro de Alto Rendimiento en Barcelona, y fue dirigido por el ex estrella de la Copa Davis, Juan Bautista Avendaño, y otros grandes de la escena del tenis español. Se convirtió en profesional en 1995 y rápidamente impuso su calidad en el circuito que culmina en 1997 por el logro de finalista en la final del Abierto de Australia. En el año siguiente ganó el Abierto de Francia de Grand Slam en Roland Garros. En 1999 llegó a la cima de la World No.1 aunque esta fue de corta duración, ya que pronto se recuperó por un tal señor Pete Sampras! Desde entonces ha jugado consistentemente en los niveles más altos, ganando muchas finales, y haciendo una contribución importante a los equipos de español de Copa Davis. Se clasifica entre los jugadores tan ilustres como Federer, Hewitt y Roddick, por haber ganado más de 500 partidos a nivel ATP. Actualmente vive en Suiza con la actriz española Carolina Cerezuela. 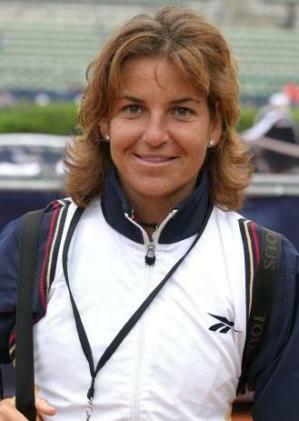 Arantxa Sanchez Vicario was born in 1971 in Barcelona and like many tennis prodigies started playing at a young age. Her older brothers Emilio and Javier who both later became professional players were her first teachers. She won her first Grand Slam title at the French Open in 1989 at the record early age of 17 beating Steffi Graf. Ultimately she became one of the most prolific women`s Grand Slam title holders with four singles, six women`s doubles, and four mixed doubles titles. Her never say die attitude and boundless energy earned her the nickname of the `Barcelona Bumblebee`. Tennis Magazine placed her in the 40 Greatest Players of the modern era, and she was the first Spanish woman to be inducted into the International Tennis Hall of Fame. She retired in 2002, coming out of retirement briefly in 2004 to play in her record fifth Olympic Games. 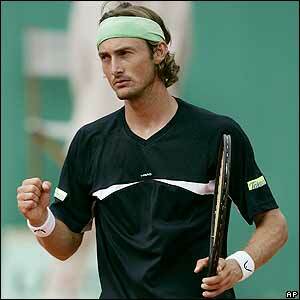 Juan Carlos Ferrero Donat was born in 1980 and started playing tennis aged seven with his father. His mother Rosario died of cancer when he was 17 and inspired him to reach the top in tennis. He achieved this ambition in 2003 when he became the world number one in the year he won the French Open at Roland Garros in Paris, and was runner-up at the US Open. He is a member of the tennis elite who have reached the quarter finals at all four Grand Slam tournaments. Renown for his clay court game he also figures as an all-rounder through his good results on hard courts. He won numerous titles throughout his illustrious career and certainly counts as one of the best Spanish players of the modern era..
Juan Carlos Ferrero Donat nació en 1980 y comenzó a jugar tenis de siete años con su padre. Su madre Rosario murió de cáncer cuando él tenía 17 años y le inspiró para llegar a la cima del tenis. Logró su ambición en el año 2003 cuando se convirtió a la número uno del mundo en el año en que ganó el campeonato Francés de Roland Garros en París, y fue subcampeón en el campeonato de los Estados Unidos. Él es un miembro de la élite del tenis que han llegado a los cuartos de final en todos los cuatro torneos de Grand Slam. Conocido por su juego en tierra batida que también figura como un todo terreno porque de sus buenos resultados en pista dura. Ganó numerosos títulos a lo largo de su ilustre carrera y sin duda se cuenta como uno de los mejores jugadores españoles de la era moderna ..
1 In 2009 Rafa Nadal played the longest tennis match in the history of the Australian Open against compatriot Fernando Verdasco. 2 Rafa's career earnings to date have been $40 million, making him the second highest earning tennis player of all time. 3 Marat Safin is fluent in Spanish as well as Russian and English, and used to live in Valencia. 4 In 1995 Arantxa Sanchez Vicario became the first Spaniard to reach the world number 1 ranking. 5 Emilio Sanchez Vicario brother of Arantxa and a former Davis Cup coach says that young Spanish tennis players are first taught how to move their feet before they are taught to swing a racquet.